The clearest examples of hospital negligence are when a healthy, younger person is admitted, and is seriously injured while a patient there. In such cases there are usually not significant pre-existing conditions that blur the line of responsibility. Many hospital negligence cases involve errors made by nursing staff. Physicians are usually independent contractors at hospitals, and not employees. 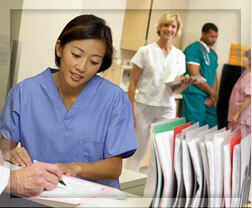 Nurses, however, usually are employees, so hospitals are often held accountable for nursing errors. Sometimes, when there is confusion about who is at fault for a serious in-hospital injury, both doctors and hospitals are named in a suit. There are many ways hospitals can fail a patient, ranging from administrative to performance in the wards. Some hospitals allow uncredentialed physicians to practice or to do procedures they are not qualified for. Or they employ providers they know are likely to do substandard work, or have troubled backgrounds. Hospital employees have administered insulin overdoses, putting patents into diabetic comas. They have failed to follow proper instrument sterilization procedures. They have administered the wrong drugs, or the wrong dosages, or contributed to misdiagnosis and mistreatment. Hospitals have been found negligent in matters of everyday patient hygiene and care. Patients have died unattended in intensive care and critical care situations. At Watts Law Firm, P.C., we apply more than 30 years of experience to obtaining compensation for you. Our aggressive, intelligent approach to malpractice cases has earned our firm respect in every part of Vermont. In short, we are the lawyer you need when you have a serious medical malpractice case. If you have lost a loved one due to nursing error — call Vermont hospital negligence attorney Norman E. Watts at (802) 457-1020. Or write to him using this online form.